How do you fix the heater in the space under the guest bathroom (opens from the outside). 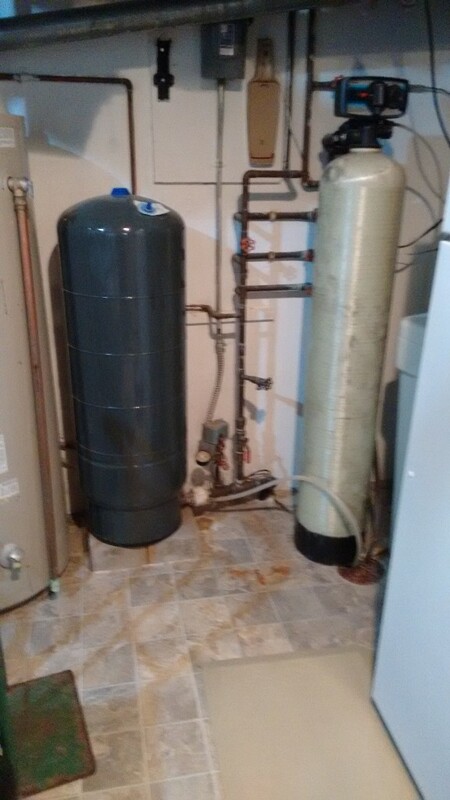 How do you turn off the water for the whole house? 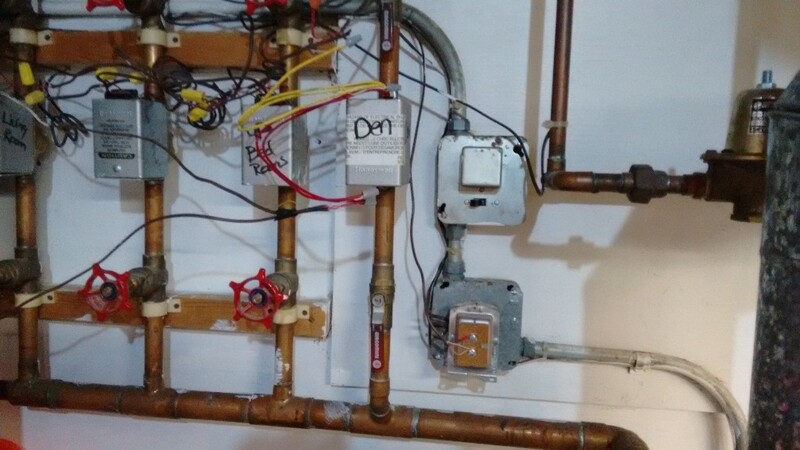 Make sure that the switch for the power to the heater is turned on. It looks like a light switch. It is high on the wall (you need a chair or step stool to reach it) as you walk into the library room in the basement. Click on the thumbnail below to see it. The switch should be up to be on. Then check the thermostat on the wall below the light switch as you enter the basement library. The top number shows the temperature in the crawlspace below the guest room bathroom. I should never drop below about 38%. If it gets down close to freezing and the switch is on there must be a problem with the heating system in the crawl space. You will need to follow the instructions below to get into the crawlspace. Enter the outdoor storage area under the guest room bathroom. The entrance is just south of the deck off of the guest bed room. Click on the thumbnail below to see it from the east side of the house. Remove the 2 screws at the bottom of the door. Use a #2 square drive bit for the power drill to loosen them. Click on the thumbnail below to see . 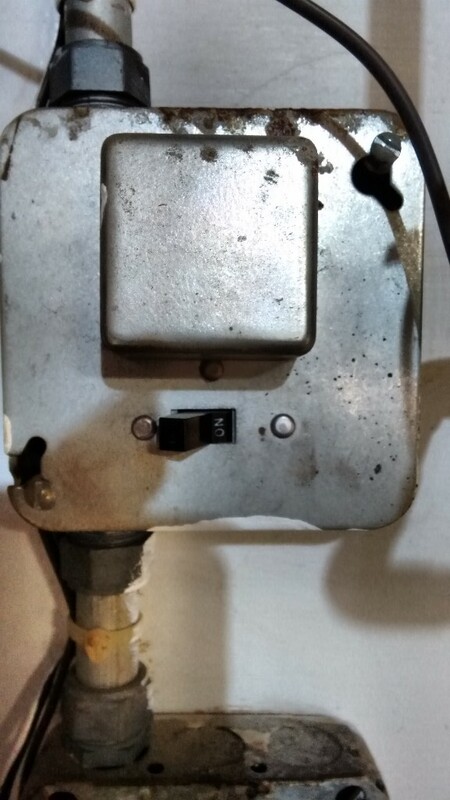 Click on the thumbnail below to see what it looks like after opening the door (prop it up on the hinges afer removing the 2 lower screws). 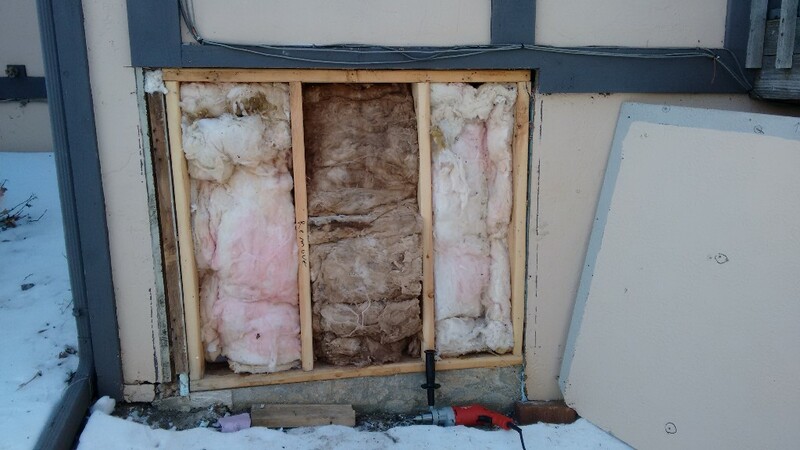 You now have exposed 3 panels which are filled with fiberglass insulation. Remove the insulation between the 2 panels on the left (leave the insulation in the panel on the right). Now use a hammer to loosen and remove the 2x4 piece of wood between the first and second panels (on left side as you face it). Now remove the plastic pieces of insulation on the left side only until you have a hole you can climb through into the crawl space. 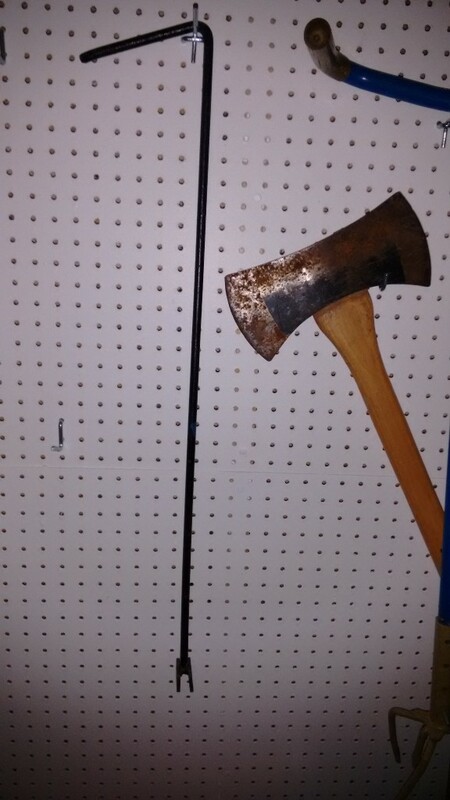 You will see a 2x4 on the left just as you enter the crawl space. Take off the latch holding it up. Bring it down. You will see a thermostat. It is set to about 40%. Do not bring it down below that. It is faulty in that it will turn off even though you are not to the off mark yet. 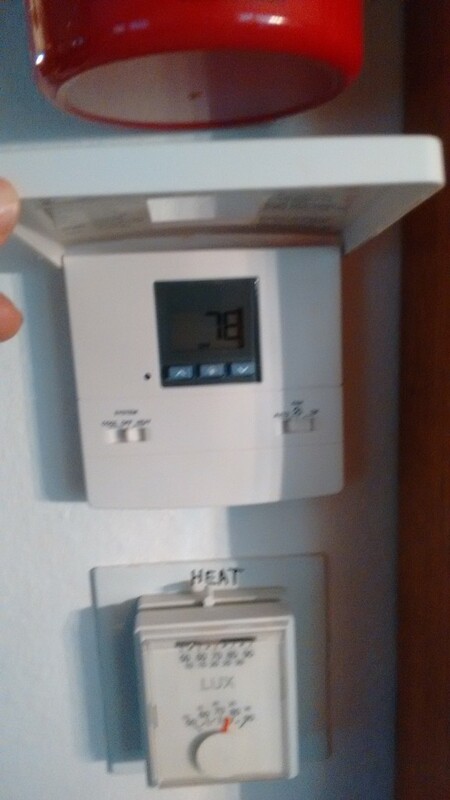 The thermostat controls the power to the outlet. 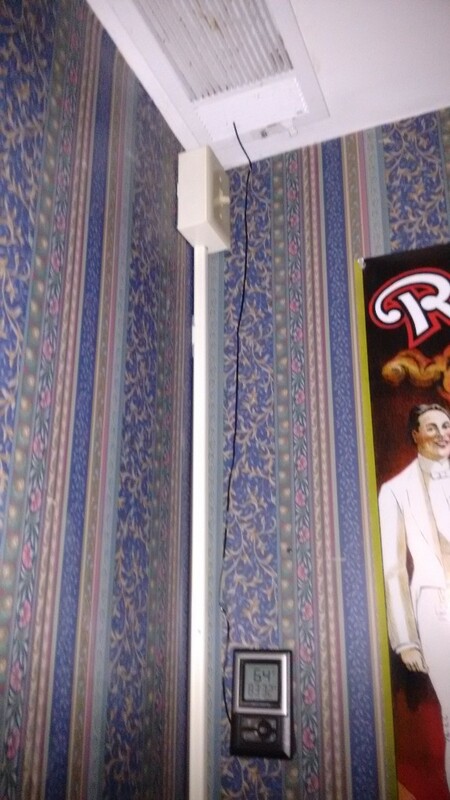 The baseboard heater is plugged into that outlet and is on whenever there is power to the outlet. If the pipes are freezing it means either the thermostat is malfunctioning or the baseboard heater is malfunctioning. When you have put the insulation back in place close the hinged door and use the power drill with the #2 square drive bit to replace the 2 screws on the bottom of the door. We had originally 3 lines on the top side of the “fern yard”. When the guy from Kalona added the 3 lower lines (closest to Chia’s) he put a switch station in the top of the yard (it’s the pipe coming out of the ground just east of Kate’s porch). He said we need to switch every 6 months using that switch station. The tool (see septic pic attachment) is hanging on the north wall of the shed. Click on the thumbnail below to see it. To switch the lines you tap off the lid to the switching station and use the tool to rotate the knob at the bottom of the pipe 180 degrees. It will only go one way, Make sure it’s turned all the way in that direction each time you do it (every 6 months). I do it on the spring and autumn equinox (March 21st and September 21st). Turn the switch in the furnace room to “Off” .Click on the thumbnails below. Left up the cover, and turn the System toggle switch to “Cool”. Leave the fan always on “Auto”. Click on the thumbnail below. Turn the switch to off (down) that is in the hallway going into the library from the pool room click on the thumbnail below. Turn the switch in the furnace room to “On”. Click on the thumbnails below. Left up the cover, and turn the System toggle switch to “Off”. Leave the fan always on “Auto”. Click on thumbnail below. Turn the switch to on (up) that is in the hallway going into the library from the pool room. Click on the thumbnail below. When you take the battery out undo the negative terminal first. When you put the battery back attach the negative terminal last. Use a 10mm socket wrench. In the basement utility room look to your right after passing the refrigerator. You'll see some pipes running up the wall. At the lower end of one of them is a red valve. It is pointing down when the water is on. It points to the side (9 o'clock) when it is closed. To turn off the water turn it from the 6 o'clock position to the 9 o'clock position. 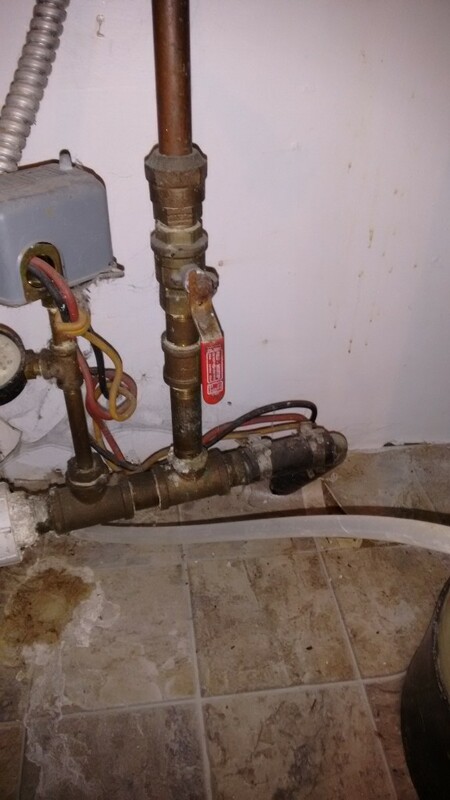 Click on the thumbnails below to see a couple snapshots of the valve. (It's open in these pictures.